ZIACOM offers a wide range of prosthetic attachments which enable the clinician and the dental laboratory to carry out functional and aesthetic restorations. The use of attachments is a key factor in implant rehabilitations. Today, the progress of the ZIACOM prosthetic components has improved, assuring the long-term success of prosthetic restorations. The company, which is a specialist in the design and manufacture of dental implants, offers a wide range of high-quality abutment systems. ZIACOM offers the professional a guarantee up to 15 years on prosthetic components, as you may check in the Guarantee Program (DOC-1074). The production of the prosthetic attachments combines technology, efficiency and compliance with all the quality standards determined by a professional team. ZIACOM offers the professional innovative solutions in the area of implant prosthetics, in order to offer the patient a prosthetic rehabilitation adapted both functionally and aesthetically to the clinical conditions. What are and what type of prosthetic attachments does ZIACOM offer to the professional? According to the prosthodontic glossary, an attachment is defined as the part of a dental implant that serves to support and/or retain a prosthesis. This is also defined as an intermediate component between the implant and the restoration. This component is retained in the implant through a screw or in some cases may be part of it. The results can be categorised as provisional and definitive according to the duration of use in the oral cavity. Healing, impression and provisional abutments are for temporary use and definitive attachments are those used for the final restoration, which may be prefabricated, customized or digital. 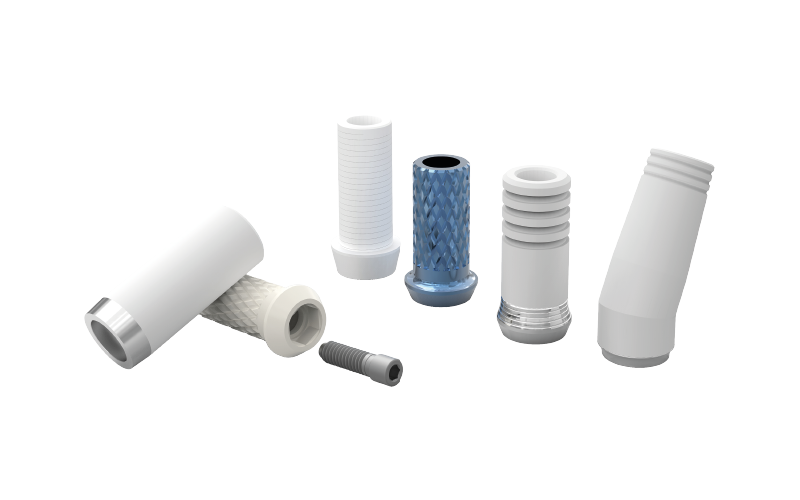 ZIACOM offers customisable anatomical healing abutments in PEEK, impression abutments for open or closed tray technique and temporary abutments in PEEK and Titanium. For final restorations, straight or angled abutments are available for both cementing and screwing, as well as the Tx30 variable rotation system for correction of angulations in screw-retained prostheses. Likewise, for rehabilitations on transepithelial abutments, the clinician can choose between the systems: Basic and XDrive and for overdentures between systems: ZM-Equator and Kirator.